It is Sunday again. Seems like time around the end of the year is “flying”. I am going to go over a familiar for all of us currency pair again. After doing my usual Sunday morning routine and going over all of the charts I’ve found GBPUSD and EURUSD to be the best candidates for a continued bear trend. I am looking at EURUSD as a potential short-seller. We are in a major downtrend. The price has fluctuated for some time above the support level. It managed to trap me, as well last week in a long trade. I’ve even contributed an article on the way this pair has taken me unprepared HERE. Currently I am more and more thinking about possibly taking the other side of this trade. The daily price action from Friday was bearish. 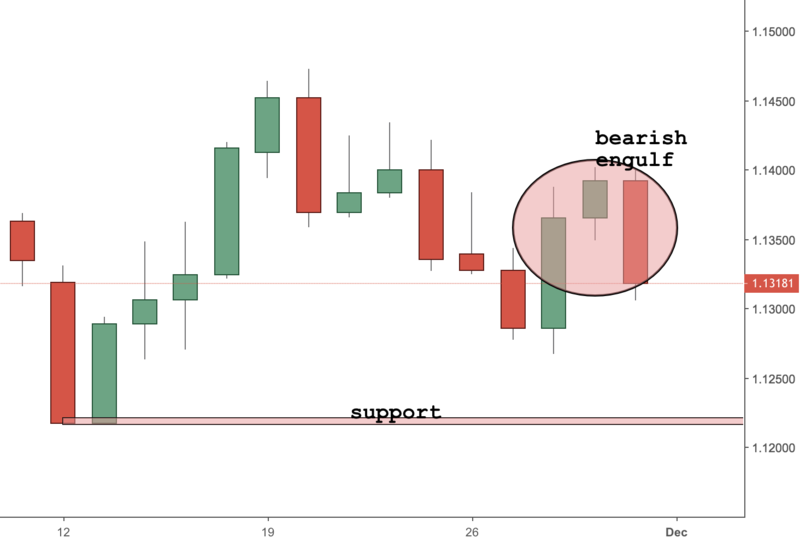 There was a bearish engulfing candlestick pattern that closed the day on Friday. I will be still cautious with this one, since we are really close to a support level as indicated in the chart above. On the other side, I will be looking for a retracement on the 4H chart. If such happens and if a candlestick pattern confirms my point of view, I might take a short trade. Instead of a conclusion, I just wanted to remind all of you the importance of patience! I have recently been asked by a student of mine why she did not see more analysis coming from my blog during November . Rushing into trades and impatience won’t do anyone good favours. I want to emphasise this here for her and everyone else that the best way to take a trade is to be patient and to wait for all stars aligning themselves. Don’t try to take every possible trade out there. That is not how you preserve your capital! Impatience is a sign of lack of experience and you should not let this “lizard” play with your brain. Let the best trades run for as long as possible, while you are not rushing into spontaneous trades. Then and only then you can count your next 1000 trades and if your P/L is still positive you can call yourselves consistent traders.